Fangirls. I am really excited about this book. I got it in the mail last week, instantly reread the first book (Miss Peregrine’s Home for Peculiar Children), and read this book all within 48 hours. I really enjoyed the first book, which is about a boy named Jacob finding out that all of the “made up” stories his grandfather used to tell him about children with peculiarities were all true. In the first book, Jacob finds the time loop where Miss Peregrine and her wards still reside, living through September 3, 1940 over and over, for around 70 years. When Jacob comes to their secret area, some really bad dudes (wights and hollowghasts) follow him, and eventually capture Miss Peregrine. Luckily, Jacob and the peculiar children he has befriended save Miss Peregrine, and decide they must cross to the mainland of Whales to continue their journey. That’s where this book picks up. So in this book, the peculiar children cross to the Welsh mainland via canoe, and have to figure out what to do. Miss Peregrine, though saved, is refusing to turn back into her human form (ymbrynes can become birds). The children use a book of tales to find other loops throughout the UK, including one full of peculiar animals, like a talking dog and chickens who lay explosive eggs. They battle hollowghasts, which are these absolutely terrifying creatures that feast on peculiars. They have a mouth full of tentacles that pull children into them. They’re true nightmare fuel, but the worst part is that no one can see them. This is why hollowghasts are so scary. Luckily, the band of peculiars includes Jacob, whose peculiarity is to be able to feel the presence of the hollowghasts, and when they’re near, he can see them. As the novel continues, the children get captured by wights (hollowghasts who have evolved to look human, except for their pupil-less eyes). After defeating the wights, they travel further through the United Kingdom, and even meet other peculiar children. Eventually, they meet up with some peculiar adults, in a loop, who help them in realizing why Miss Peregrine won’t become human again. But I’ll let you read it to find out why. This is a really neat series, and there was a point when I was very worried that this book wouldn’t have a sequel. I was quite relieved when it was revealed that the series couldn’t end there. 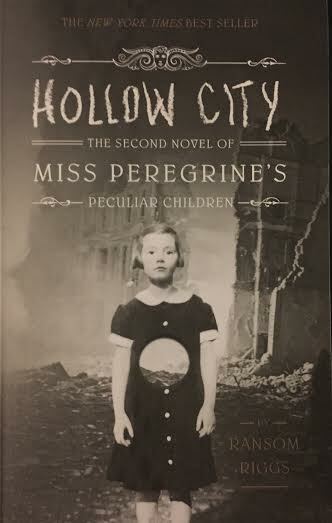 So Fangirls, please join me in reading the Miss Peregrine’s Home for Peculiar Children series. Ransom Riggs is doing incredibly clever things, using history with peculiar photographs to fully bring readers into the amazing world he has created. Both the hardcover and paperback versions of the book are in print, so go grab it right now, and fall in love with Jacob, Emma, and all of the peculiar children you haven’t met yet!